iPhone users will no longer have to load Safari to initiate a search for content on the Web or within Wikipedia, when links to both are added to Spotlight search in iPhone OS 4.0 this summer. 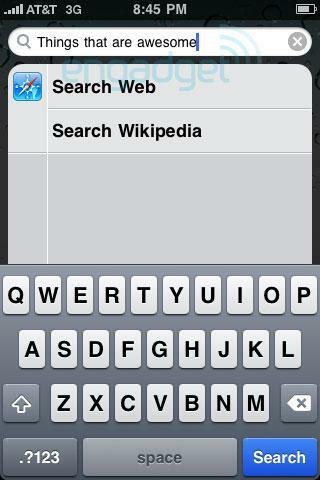 First discovered by Engadget, the feature offers the options "Search Web" and "Search Wikipedia" when typing a query into the iPhone Spotlight search. The report noted that similar capabilities are available in Palm's WebOS, Google's Android, and Microsoft's forthcoming Windows Phone 7 mobile operating systems. The new capability is one of more than 100 new features added in iPhone OS 4.0, due to arrive this summer. Apple on Thursday highlighted seven major "tentpole" features included in the new operating system: multitasking, folders, improved mail, iBooks for iPhone and iPod touch, new enterprise features, Game Center, and iAd. Spotlight search first came to the iPhone in version 3.0 of the device's mobile operating system. The feature can be used to quickly find and launch an application or search content, including music files and e-mails. The search function is immediately accessible by flicking the home screen to the left. It also serves as a quick way to pull up contacts, by searching for a person's name, or even by the company they work for.